Rutile is the mineral within the Quartz that looks like tiny fibres or very fine needles. Rutile can be many colours but is often, gold, silver, red, black or orange. 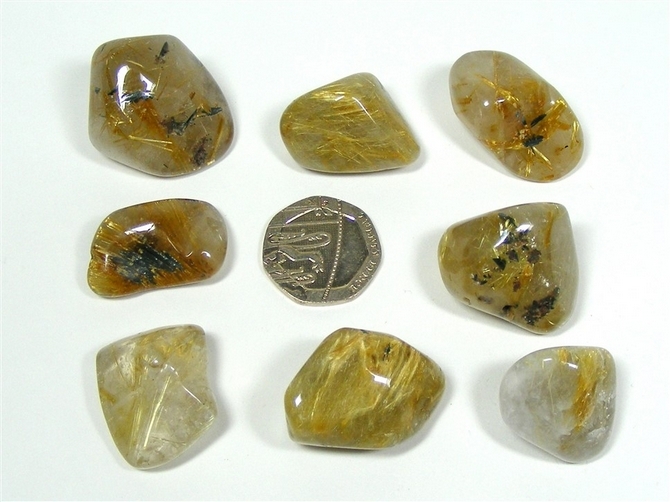 These stones all have Golden Rutile present. 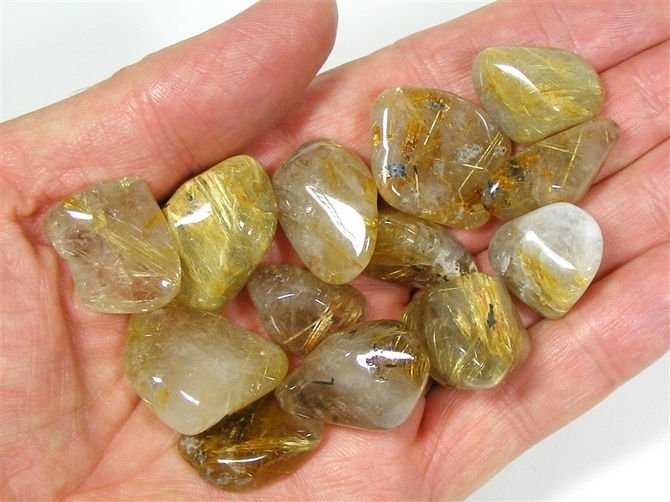 Rutilated Quartz may be helpful to us when our energy levels are run down or when we are physically exhausted. It is thought to be beneficial in treating problems of the respiratory tract and bronchitis, in balancing the thyroid, strengthening the vein walls and helping with torn or broken tissue. If we choose to examine the darker side of our psyche, Rutilated Quartz can offer us support while we do this and also support us during any subsequent emotional release. It helps to lift dark moods and depression, helps to relieve fears, phobias and anxieties and is extremely useful in cases of self-hatred. It can enhance our insight and understanding of problems and can help us to be more forgiving. Rutilated Quartz helps to cleanse and energise our aura. It helps us to communicate with our higher self and with our spiritual guides too. It is a crystal for spiritual growth helping us to realise that each and every person is capable of experiencing the power of the universe. Rutilated Quartz can assist us with astral travel, and during our astral travelling, it may help to explain why we visited certain places and why we saw certain things. It can also help us to make the connection between where we went, what we saw, and our experiences in this life. Rutilated Quartz also enhances our scrying and our channeling skills.